Learn how to make Kombucha at home with this easy kombucha recipe. Kombucha is a drink made from sweet tea, is slightly carbonated and delicious! It not only tastes good but is also a good for you probiotic drink. Kombucha is a drink made from sweet tea, is slightly carbonated and delicious! Being full of probiotics, B vitamins and enzymes, it not only tastes good but is also good for you. If you have not tasted Kombucha before, you might want to buy a bottle at your grocery store or health food store. While a purchased bottle of Kombucha will often cost around $3+, you can make your own for much less. Kombucha is naturally carbonated tea that starts with a Kombucha scoby (also called a starter or mushroom) which looks like a flat grayish disk – see the picture below. Since the scoby does grow and multiply, if you know of someone who already makes Kombucha, they may share with you. 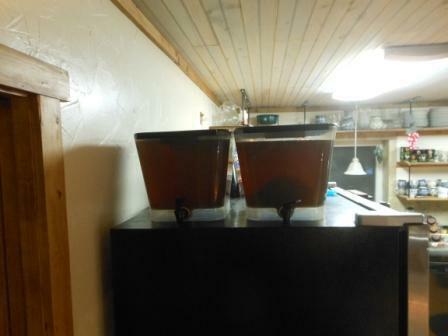 If you need a scoby from my affiliate, you can find one here that is shipped live and NOT dehydrated. Mine came from my daughter-in-law, Jessica. The scoby is reused and transferred from one batch to the next and consists of yeast and bacteria which live together in a symbiotic relationship. SCOBY is an acronym for Symbiotic Colony of Bacteria and Yeast. Once the scoby is combined with brewed tea, sugar and water, it is allowed to ferment for 7 – 10 days (depending on taste). In any kombucha recipe, the longer you leave the tea fermenting, the stronger the flavor will be. That being said, leave it for 7 days and begin tasting it daily. The majority of my family does not like it really strong – it tastes too much like apple cider vinegar – so I pour mine off before that point. It is easiest to make a gallon at a time unless you have a large family. I was able to find 1 gallon glass jars at Walmart and had 4 of them going on top of my refrigerator at one time. I am now using two 3 gallon tea dispensers which is working very well. I now use a Continuous Brew Method that works great and involves much less clean up. by Sally Fallon – I multiply this recipe to make 6 gallons at a time. Healthy bacteria are necessary for our guts. You can make your own at home quite inexpensively. Put a piece of cheesecloth over the top of the jar and secure with a rubber band - this allows air in but keeps bugs and dust out. Place the jar in an out of the way place. If your kitchen is warm, the Kombucha will ferment more quickly, so for the first batch or so, taste it after 3 or 4 days. Once the taste is to your liking, remove the scoby and place in another jar to begin your next batch. The fermented Kombucha may be stored in the refrigerator and enjoyed at will. 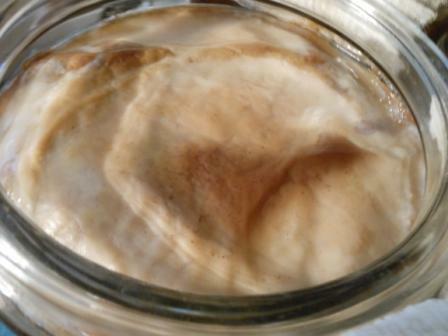 The scoby needs sugar to live on - honey, rapadura or sugar substitutes will not work. I am getting ready to make my first batch with a scoby from a coworker. I have a couple questions before I start- just want to clarify so i don’t mess it up :). 1) When do I pour the boiled water/tea into the jar? When it is at room temp before adding the scoby? 2) Your recipe list has 2 cups of kombucha but your is instructions say to add 1/2 cup of kombucha. Which is it? My scoby only came with a little bit of kombucha, so i’m not sure if I need to purchase some extra. Thank you for you help! Jackie, I am so excited for you that you are beginning to make your own – you’re gonna love it! So, for your questions: 1. Be sure that you tea is completely cool BEFORE adding your scoby. 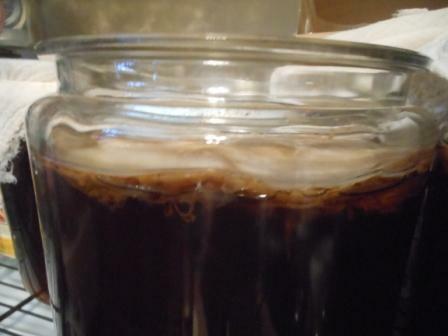 If you want to pour it into the jar to cool that is fine just have the scoby somewhere else and add it later. 2. Thank you for drawing my attention to the discrepancy. It should have been 1 cup for both. As long as you have 1/2 cup of kombucha you are good but I normally add 1 cup because I have it and it cut down on the wait time before it is ready to drink. If you have less than 1/2 cup, I would buy some prepared kombucha. I hope this helps!